Background and aim: This technical review is an official statement of the European Society of Gastrointestinal Endoscopy (ESGE). It addresses the utilization of advanced endoscopic imaging in gastrointestinal (GI) endoscopy. Methods: This technical review is based on a systematic literature search to evaluate the evidence supporting the use of advanced endoscopic imaging throughout the GI tract. Technologies considered include narrowed-spectrum endoscopy (narrow band imaging [NBI]; flexible spectral imaging color enhancement [FICE]; i-Scan digital contrast [I-SCAN]), autofluorescence imaging (AFI), and confocal laser endomicroscopy (CLE). The Grading of Recommendations Assessment, Development and Evaluation (GRADE) system was adopted to define the strength of recommendation and the quality of evidence. 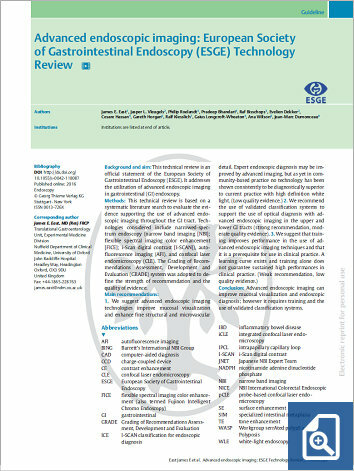 2 We recommend the use of validated classification systems to support the use of optical diagnosis with advanced endoscopic imaging in the upper and lower GI tracts (strong recommendation, moderate quality evidence). 3 We suggest that training improves performance in the use of advanced endoscopic imaging techniques and that it is a prerequisite for use in clinical practice. A learning curve exists and training alone does not guarantee sustained high performances in clinical practice. (Weak recommendation, low quality evidence.) Conclusion: Advanced endoscopic imaging can improve mucosal visualization and endoscopic diagnosis; however it requires training and the use of validated classification systems.